And what of the Ferraris, that plenty were speculating would win out today? Well, it didn't quite happen for the team. Not to the fullest extent anyway. Sebastian Vettel looked well-poised in second on the grid but his day went to bits in a scrappy run. It became clear that against many expectations in a race stint he did not have the legs of the Mercs, when in the early laps Lewis crept clear then the other Merc of Nico Rosberg having already cleared Kimi Raikkonen speared past Seb too. Twice the Ferrari pit crew got him back ahead of Nico, but both times Nico got back past almost immediately. And the second time Vettel aided the manoeuvre by running off the track, damaging his front wing and making an extra stop to change it. He then spent around 20 laps not being able to pass Valtteri Bottas, meaning fifth was his diminished reward. His gleaming new Ferrari career has therefore had its first blotch. And the man himself admitted that he simply "tried a bit too hard today". Suddenly the quiet confidence of Merc after qualifying, and Ferrari's apparent constraint at the same time, made sense. Nico Rosberg was right that those in silver had changed things since Friday practice in which the Ferraris seemed to have the wood on its direct rivals in silver. But the fight from the red corner was not done and came instead from a new - but not exactly new - source in Kimi Raikkonen. 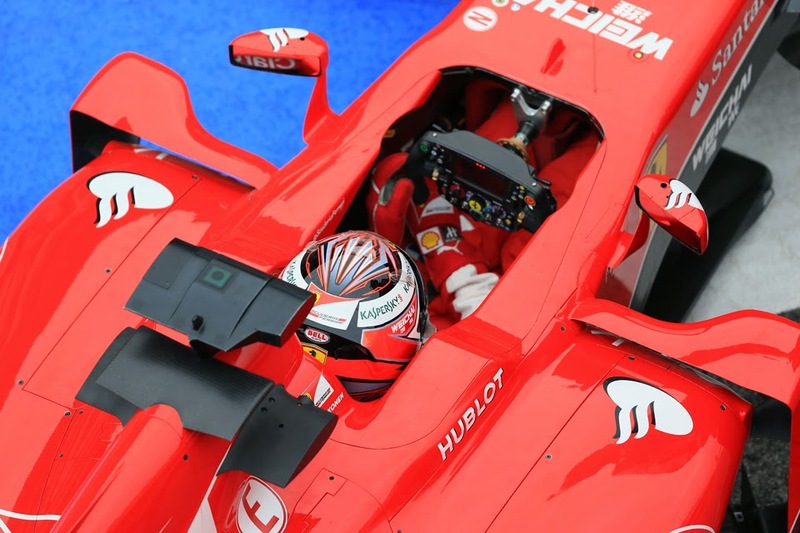 Kimi's shown plenty of signs of looking back to something like his old self in 2015, with the Ferrari's handling now much more to his palette. And racing today was the classic Kimi that we saw so often in his Lotus days. His touch behind the wheel of his F15-T looked ethereal, and he ghosted into view on a longer and rather against the grain strategy. Come his short final stint on soft tyres he ripped shreds from the gap to the Mercs ahead, and for a time it looked that even a win could be on the cards. As it was his pace advantage drifted down the way, but still Nico Rosberg was in his sights with two laps left. But that was resolved when Nico hit the brakes for turn one and discovered that a brake-by-wire problem chose that moment to manifest itself, and his trip through the run-off area let Kimi by. Nico reckoned he'd have retained second without the problem. Kimi too thought passing may have been tough. Others weren't so sure. Initially we suspected a mere boo-boo form Nico that undid his previous good work, but we discovered the truth later (and Lewis having his own problem was a bit of a signpost). It might sound a silly thing to say on a day that he ceded ten more points to his team mate, but Nico on reflection may be pretty well pleased with his effort this time. If nothing else he showed that whatever else is happening he still has fight. Four times he passed a Ferrari in robust fashion. "Nico is back, that's the most important (thing)" said Niki Lauda later. While Kimi despite bagging his first podium finish since late in 2013 admitted to mixed emotions, but he also looked ahead with optimism: "Obviously you're never happy when you finish second. After a difficult start to the year I'm a bit pleased to get some result. We came through in the end very quickly but we ran out of laps but I think we have to be happy after where we qualified, but obviously we're looking for a bit better result still. "I'm very happy with how the team is working; obviously after last year where we are now is a big step...As a team we'll get there to be all the time fighting for wins, but it'll take a little bit more time." But the resurgent Nico and even the resurgent Kimi wasn't the big story in Bahrain this time. It was instead a story of old established power, those of Lewis and Mercedes still winning out on a weekend when much seemed stacked against it. Indeed Lauda, blunt as always, reminded us as much just after the chequered flag dropped: "Don't forget he (Lewis) won the race again." You'd be forgiven for considering it habitual. Lewis took up the subject too: "I think today we've shown Mercedes is still the best and we are working as we can to keep up this momentum we have" he said. "It doesn't particularly matter who it's against, you want to beat everyone out there, but naturally it's great to be having a battle with the Ferraris". Of the rest as mentioned Bottas put in a timely and spirited drive to fourth place which reminded us of his star quality, warding off Seb for several laps by the old-fashioned expedient of not putting a wheel out of place. It was a good day it seemed for bouncing back. Felipe Massa though had a tough time, with him having to start from the pits due to mechanical problems and while he made good progress his strategy was curious - a three-stopper apparently converted to a two-stopper midstream - and his lengthy final stint helped him fall down the order to tenth. He reported too that contact from the rear from Pastor Maldonado cost him downforce. Indeed it was a race that came to the two-stoppers - Nico Rosberg indeed apparently planned to stop three times only to find that there wasn't enough pace available from the extra wheel change to justify it, thus he abandoned the plan. And all in the top ten - aside from Seb who as mentioned stopped an extra time for a wing change - stopped twice. 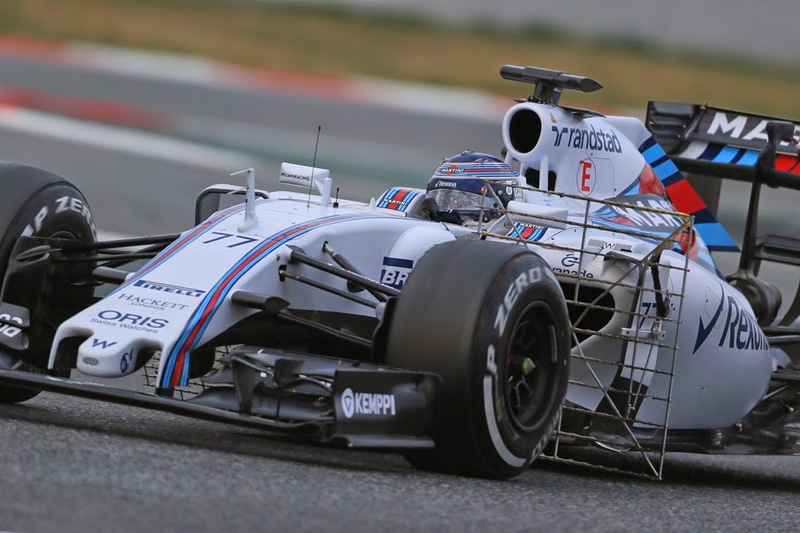 Others such as Nico Hulkenberg and Felipe Nasr stopped three times but it didn't do much for them. On the flip side, the likes of Sergio Perez and Daniil Kvyat stopped twice and managed to get something tangible from their Bahrain visit. For Kvyat it's a timely result for him too, given there has been the odd bit of muttering about him. The other points scorers were Daniel Ricciardo in sixth (another to bounce back), benefiting from a Red Bull that looked a bit more on it this time, though he was reminded of its old problems when his Renault went pop as he accelerated over the line at the end. And Romain Grosjean again made good on the form of the Lotus with seventh place. Just like in China his stable mate Maldonado would have been there too but for another couple of maddening errors. First off he got a time penalty for missing his grid slot somehow, then had a massive delay at his final stop which early reports attributed to another driver error. And - sit down for this one - a McLaren got within four seconds of scoring a point. Fernando Alonso indeed was combative and determined on his own two-stopper, and in his P11 finish he beat two Saubers, one Force India and a delayed Lotus. That definitely is progress. The team has been promising a big step for the next round in Barcelona for a while now too. But there's one thing that likely won't change in Barcelona. that Mercedes and particularly Lewis Hamilton are tough to stop right now. Perhaps the major take-out from today's Bahrain Grand Prix is that even when circumstances conspire to benefit its closest rivals, Lewis and his W06 are not to be touched. Despite what a lot of people think, Rosberg is still in it. It's a long season and a couple of errors or DNFs and it's a reset. I like the way Hamilton goes out of his way to praise the car, the team at the track and the team back in the UK. I was a huge Mansell fan back in the day, but Mansell seemed to suggest it was all down to him. 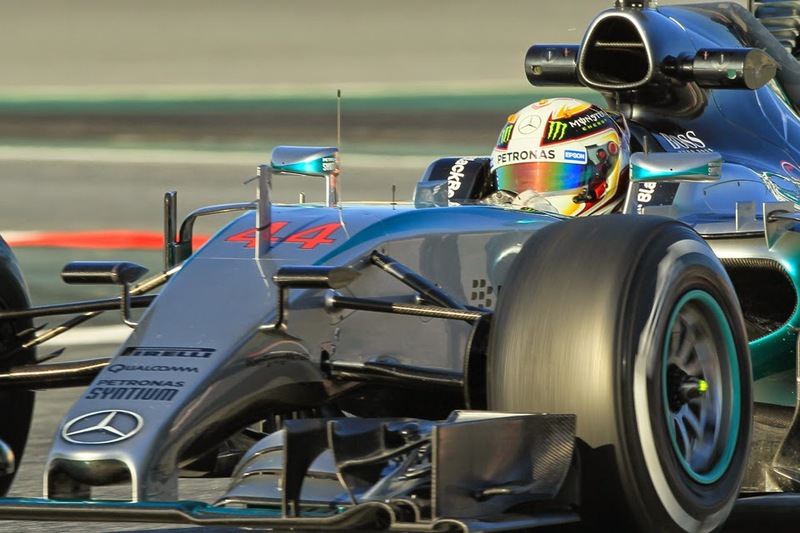 Of course Hamilton thinks he is the best in the world, but he leaves it for others to say. Something that occurred to me over the weekend is that if you look at the first four rounds of this season and compare it to the first four rounds of last season, loosely speaking the only difference in Lewis vs Nico is that last year Lewis had his mechanical breakdown in Melbourne. Perhaps we are getting a bit over excited on this 'Nico's defeated' idea. Agree on Mansell. He was a great racer, but also he wasn't one to underestimate his own ability!